Spoilers ahead for The Sundered! Five years after the presumed death of Captain James T. Kirk, the U.S.S. Excelsior, commanded by Captain Hikaru Sulu, is at the forefront of exploration, diplomacy, and the defense of the Federation. Unprecedented peace talks with the violently xenophobic Tholian Assembly trigger a deadly confrontation aboard the Excelsior. Now Sulu and his crew -- including Chekov, Rand, Chapel, Tuvok, and Akaar -- are thrust into an unexpected conflict between the Tholians and a mysterious new enemy, the Neyel...whose origins, if revealed, could lead to war with Earth itself. As the Tholians weave a web of vengeance, the Excelsior is flung beyond the galaxy to discover the hidden truth about the alien Neyel, forcing Sulu to question where his responsibilities lie -- with the fragile peace he must preserve, or with the victims of his own world's tragic past. Star Trek VI: The Undiscovered Country was the first Trek film I saw in the theatre. I remember being amazed at seeing my heroes on the big screen; Captain Kirk and Mr. Spock leading the charge in preserving peace between the Federation and the Klingons and defeating the nasty General Chang. However, what really captured my attention was the U.S.S. Excelsior and her captain, Hikaru Sulu. I recall marveling at the decision to take an existing crewmember and promoting him, giving him his own ship, and making it one as cool as the Excelsior (even though I had a heck of a time pronouncing it properly at the time). I am sure I was not alone in wanting a George Takei-led Star Trek series featuring the adventures of the Excelsior under Sulu's command. In fact, at the time, I assumed it was just a given that we would be getting that series! Captain Sulu and the crew of the U.S.S. Excelsior are featured in The Sundered. Alas, that was not to happen. We did get a bit of a taste of what might have been with the Voyager episode "Flashback," but that was not enough to whet my appetite for the adventures of Captain Sulu. Thankfully, we have the novels to fill that need! There have been a number of novels over the years that chronicle Sulu's command of the Excelsior, a couple of which I have covered before: The Captain's Daughter by Peter David is one, as is Forged in Fire by Martin and Mangels, the authors of the subject of this review. 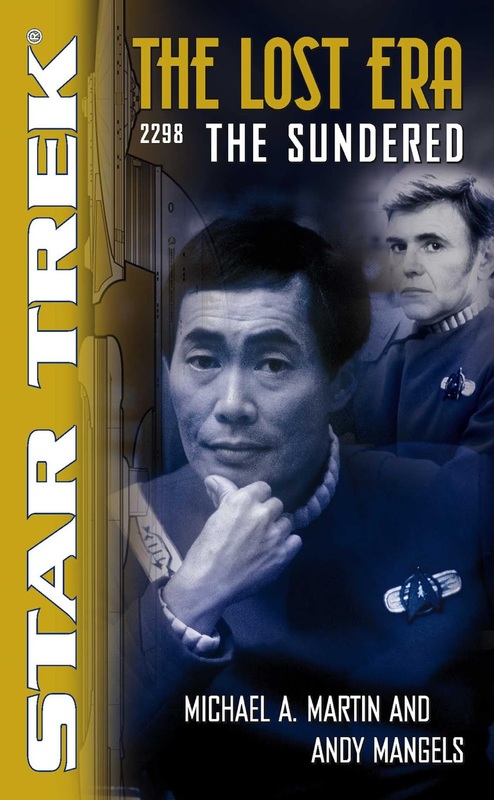 This novel, The Sundered, kicks off the Lost Era series, chronicling events that take place between Kirk's presumed death aboard the Enterprise-B in Generations and the start of the Star Trek: The Next Generation television series. This particular adventure takes place in 2298, five years after the incident in Generations, and features Sulu taking on a mission to negotiate with the reclusive Tholians, first seen in the TOS episode "The Tholian Web." Aboard the Excelsior is a Federation diplomat, Aidan Burgess, who at first seems to fulfill the Trek trope of the Federation official who makes the lives of our heroes difficult. She has a very clear plan for dealing with the Tholians and sees Sulu and his crew as obstacles in the way of the negotiations, which causes a great deal of tension between her and the Starfleet officers. We soon learn that the Tholians are battling a mysterious race that has entered their space through a sort of spatial rift. The history of this new species is really quite interesting: calling themselves the Neyel, they were originally humans who lived in habitats operating near Earth at the LaGrange points in the 21st century. A warp field experiment propelled them into interstellar space, where their first encounters with extraterrestrials made them extremely wary of other lifeforms. From there, another event propelled them even further, out into the Small Magellanic Cloud, a neighboring "dwarf galaxy" just outside the Milky Way galaxy. 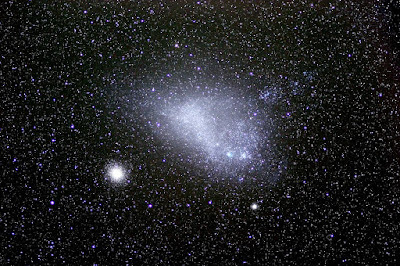 The Small Magellanic Cloud, a dwarf galaxy that neighbors our own Milky Way, is the adopted home of the mysterious Neyel. To me, the Neyel are the most fascinating part of this novel. Reminiscent of the sundering of the Vulcans and Romulans thousands of years ago, the Neyel represent an offshoot of humanity that evolved in very different conditions from those of their counterparts on Earth. They are an interesting exploration of the "path not taken," having to adapt to living in extreme conditions by natural adaptations as well as focused genetic engineering that has resulted in a species that appears very different from what we would consider "human." We are all a culmination of our experiences, and in the case of the Neyel, they have experienced extreme hardships and have thus been extremely hardened, both physically and with respect to their culture and outlook on the universe. I also found the names that they have taken on to be very clever; "Neyel" represents a form of language drift, adapted from the name of their original habitat, which was an "O'Neill" station. Their leader is called a "Drech'tor," which of course derives from "Director," the leader of the original colony. This reminded me of a much more recent example of this in Star Trek: the Short Treks episode "Calypso" featured a glimpse at the future of the galaxy, 1000 years beyond the 23rd century, in which a group of humans are fighting an enemy called the "V'Draysh," which turns out to be the "Federation." In addition to the Neyel, The Sundered also features a cast of interesting characters that make up the crew of the Excelsior, a few of whom we will meet again in later Star Trek installments. Thanks to Voyager's "Flashback," we have Tuvok as a part of the crew, along with Leonard James Akaar, whom fans of the novels know will go on to become commander-in-chief of Starfleet in books set in the post-Star Trek Nemesis era. Other characters I found interesting included Commander Lojur, a Halkan who was exiled from his planet due to his deviation from their philosophy of complete pacifism, and of course familiar faces Chekov, Rand, and Chapel. There are a number of memorable moments in this novel, including an intense duel between Captain Sulu and a Tholian using a "monomolecular blade," a nasty weapon that sounds far too dangerous for me to even consider getting near. A highlight to me as well was the final decision by Ambassador Burgess to remain with the Neyel at the end of the novel, making me appreciate the character all the more. The events of this novel will also feature in future stories, most notably the second novel in the Star Trek: Titan series, The Red King, which Bruce Gibson and I will be reading soon for an upcoming episode of the Literary Treks podcast. A very memorable story that serves as a terrific start to the Lost Era series. The Neyel are a fascinating exploration of a branch of humanity that is nearly unrecognizable, but still ultimately human for good and for ill. There was also a great deal of insight into the Tholians, which I really appreciate, as they are a species that I always love to learn more about. I enjoyed the authors' efforts at reconciling various accounts of the Tholians into a cohesive version of them for this novel. A strong story featuring interesting characters and a setup from which to launch future stories, The Sundered really is Martin and Mangels at their best, and I found myself thoroughly enjoying every aspect of the book. Book three of the I.K.S. Gorkon series: Enemy Territory by Keith R.A. DeCandido.